Linux 4.19 gave us preliminary support for WiFi 6 aka 802.11ax, a new experimental EROFS (Enhanced Read-Only File System) designed for firmware and live CDs, more fixes for L1TF “Foreshadow” security flaw, and more. Support for Raven2 APU and Picasso APUs; Vega20 support is no longer considered experimental. Bring up DSI and HDMI on Exynos5250 Arndale. Use the new way of setting external wake-up interrupts on S5Pv210. Use proper cpufreq suspend OPP to fix suspend/wake-up from RAM on Snow Chromebook (Exynos5250). Fully describe regulators on Odroid XU3-family boards. Fix sound in Snow-rev5 Chromebook. Fix regulators configuration on Peach Pi/Pit Chromebooks (Exynos5420) which should be always on. essentially fixes waking up by RTC. Add PMIC interrupts on Exynos4210 UniversalC210 board. Add external SD card support for Trats board (Exynos4210). Correct audio subsystem parent clock on Peach Chromebooks. Use graph between USB-PHY and MUIC. 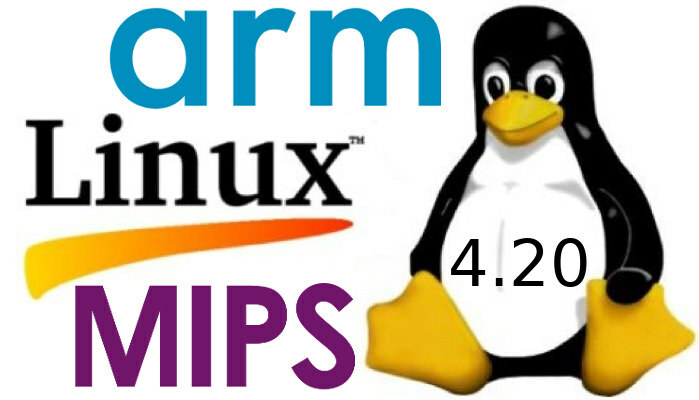 including the MIPS Coherence Manager & related hardware. accesses, and fixes in their use. reliance on the old bootmem code. A number of fixes & improvements for Loongson 3 systems. DT & config updates for the Microsemi Ocelot platform. Workaround to enable USB power on the Netgear WNDR3400v3. You can read a more complete Linux 4.20 changelog (here)with comments only generated with git log v4.19..v4.20 --statcommand, and you’ll also find summary of changes on KernelNewbies. It seems with 4.20 the Banana Pi M2 Ultra is finally usable*. The R40 GMAC and SATA interfaces are working. So it’s finally as usable as RPi has been for years? Allwinner H3 ‘as a multimedia thing’ worked from the beginning — though partially with proprietary and closed source stuff (Android libs provided by the SoC manufacturer). The above comment was about multimedia with all OS SW, something the RPi will never see (OS means open source, a concept RPi fanboys might not be familiar with). It’s about open source software and not proprietary closed source crap as it’s the case on those Raspberries. All the multimedia/video/camera stuff runs on the closed source RTOS called ThreadX and to be able to use it from within Linux a proprietary interface called /dev/vchiq is needed. TL;DR: Thanks to a great open source community called linux-sunxi low-cost Allwinner SoCs can now be used with multimedia use cases fully running with open source software. This is neither the case with RPi nor will this ever happen since the RPi is a closed source platform running a proprietary RTOS as main operating system without any open source communities dedicated to it. I just was going to write what so big change happened to H3 cause I ‘ve seen only the line with H3 – SID in changes. Until I didn’t see the first line 🙂 Unfortunately all my Orange PI boxes have some issues with HDMI and I’m using them for non-multimedia purposes (which they serve perfectly with Armbian server) .